The spread of breast cancer to the bone affects approximately 85% of patients with advanced disease, and renders them largely untreatable. Researchers at BRIC (University of Copenhagen) and the University of Sheffield UK have uncovered how a certain enzyme, produced by cancer cells in breast cancer patients, plays a central role in helping the spread of cancer cells to the bones. By blocking this enzyme, it is possible to prevent the cancer cells from growing in the bone and thereby save lives. 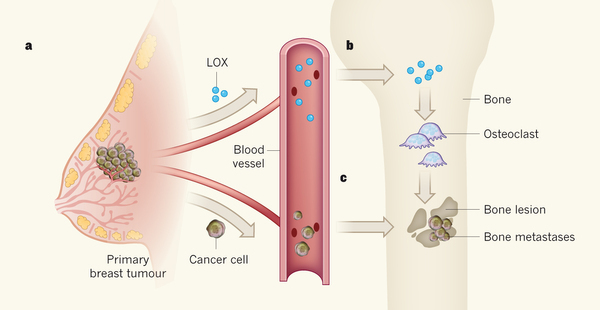 The group of researchers lead by Janine Erler at BRIC at the University of Copenhagen and Alison Gartland at the University of Sheffield UK have discovered that certain types of breast cancer cells produce large amounts of the enzyme Lysyl oxidase (LOX), which helps the spread of cancer cells to the bone, by preparing the bone tissue for the arrival of cancer cells. tumour, causes the formation of holes in the bone at distant sites to ‘clear space’ for the incoming cancer cells. This allows the breast cancer cells to take up residence in the bone, a place they would not normally be found. This study provides new understanding into how LOX produces these holes in the bone through a newly identified mechanism that causes a decrease in the activity of bone building cells, and an increase in the activity of bone destroying cells that normally work in balance in the bone. The findings of the paper show that in certain breast cancer patients, there may be an added benefit of treating patients following diagnosis and surgery with bisphosphonates, an already approved drug in the clinic for the treatment of osteoporosis. ‐ Bisphosphonates work by blocking the action of bone destroying cells (called osteoclasts). This then prevents cancer cell LOX from generating holes within the bone, and therefore reduces the ability of breast cancer cells to spread to the bone. Thus we propose that breast cancer patients whose. tumours produce high levels of LOX should be considered for treatment with bisphosphonates. Such treatment may improve the survival of patients by reducing the likelihood of the cancer cells spreading to the bone. Thomas Cox, postdoctoral research fellow in the Erler group. The results have just been published in the international journal NATURE. The study was carried out at University of Sheffield UK and BRIC and funded by BRIC, Velux Foundations, Novo Nordisk Foundation, Danish Cancer Society, Lundbeck Foundation and Breast Cancer Campaign and Breakthrough Breast Cancer.